Larry and I are still sleep deprived…. 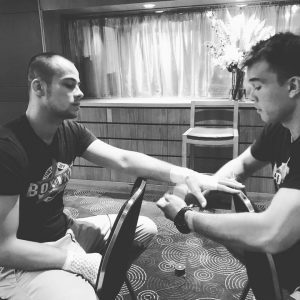 With Billy and Ben getting ready to jump in the ring this week fighting for and defending titles lets not forget that while they are in there on their own it is not just them fighting. Let’s give a shout out to the training partners, the sparring partners, everyone supporting them on the night, the wives and kids who accept that Dad can not be at the family function because he needs to go on a 5 hour road trip to be there with the fighter, Boxing Works which supports and gives them an a home and environment to train and grow in, not forgetting the sponsors who give product and services to help the fighters perform at their peak. When all of this comes together magic happens. The magic isn’t in the win, the magic is when you see all the support team be there to help the fighter do his job, when in a crowd of hundreds all you hear are the voices supporting your fighter, when you know that he or she has left nothing behind everything they had was given in the ring. This week we will get to see Ben and Billy make magic. Ben will be defending his OPBF Welterweight Title against a strong opponent. We have tickets available at Boxing Works Kings Cross and can bring them down to Surry Hills or Tramsheds, just send us a message. 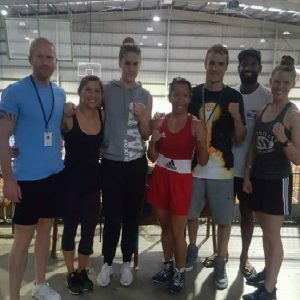 Local fight at the Star Casino so lets show Ben the support her deserves. Ben has been training like a champ while still giving his guys the support and coaching they need for their own fights. Viviana and Caitlin both did him proud over the last couple of weeks with wins of their own. Billy has spent the last month in Thailand getting ready for his own Australian Title Fight up in Port Maquarie. We know it is a huge call for anyone to make up there but Tim, Simon and Eoin are all making the 5 hour drive up to show their support and be in his corner. I know that everyone at Boxing Works are going to be sending their best wishes and biting their nails waiting for the results to come through. We will update FB as soon as we have the good news. Bernadette Chua, joined Boxing Works in December 2013. Bernie had her debut exhibition match on March 23rd, trains predominately at Boxing Works Surry Hills and Boxing Works Kings Cross. Ally What convinced you to join Boxing Works? Bernie I was looking to try a new form of exercise and I had done a bit of boxer-cise with my previous personal trainer. I was hooked and so after I stopped training with him, I started looking for a place that offered serious boxing training. I joined Boxing Works because Larry had great credentials and the gym looked like it had great trainers. So I started personal training with Simon (Patmore) to get my skill level up and I haven’t looked back since. I’ve got a great squad of girls I train and our BW Kings Cross head boxing coach Ben (Savva) pushes us to be at our best. Ally You had your debut exhibition boxing match on March 23 , what was the hardest hurdle to get over in the lead up? Bernie The weight cutting was the hardest challenge I had preparing for this fight. I was a few kilos over my fight weight in the week leading up to the exhibition. But I wasn’t going to step in the ring not being as close to weight as possible. Not only would it have been disrespectful to my opponent, but most of all, to my coaches. So it was a week of running, sweat suits, being hungry and not a lot of water. Thankfully in the end, I did get there. Ally Were you nervous or scared on fight day? Bernie I had some nerves for an hour or two during the day. But I had a great support unit of people around me giving me advice about how to prepare for the fight and keeping me calm. I was more excited than anything. It’s been something that I’ve been talking about doing for the last two years, and after making some massive changes in my lifestyle six months ago, I finally stepped in the ring. Ally How did you feel after the match? Bernie On top of the moon. 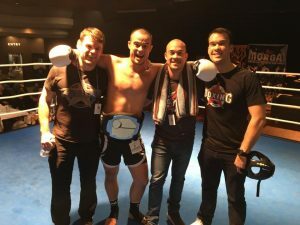 It was a massive achievement and I just wanted to get back into the ring! Ally What is your next challenge? Bernie Just to get a few more fights in over the next few months and hopefully try and win a novice title later this year. Ally What makes Boxing Works different to any other gyms? Bernie The people. While Simon and Ben have worked their butts off to get me to this stage, other trainers like Billy, Tim and Eoin have also been such a great support. And of course, the girls I train with are so encouraging and we push one another to be better. Boxing Works has the biggest female elite squad in NSW and I’m so lucky to have great girls like Lizza, Annabel, Viv, Caitlin, Kylie and Daria around. Ally What would you tell people who are thinking of joining Boxing Works? Bernie Do it. Even if you just want to get fit, make new friends or learn a new skill, this is the place to do it. You don’t just join a gym, you join a family. A 30 min class ideal for people new to Boxing, focus on stance and basic strikes and combinations. This class will give you the confidence to jump into the Boxing Skills and Conditioning classes. Introduction to sparring for those looking at taking their training to the next level. Mouth Guards, head gear and 16oz gloves are mandatory. Tuff Mouthguards will be coming to Tramsheds to fit you for mouth guards if you do not have a fitted mouthguard yet, Gloves and head gear available at all gyms.